Early July fruits with a reliable variety of extra large fruit. Good for culinary and dessert purposes. 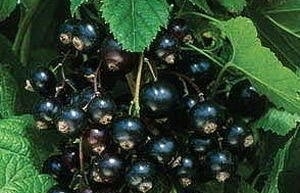 Where possible plant new cane in ground which has never cropped blackcurrants before, and avoid wet or boggy areas. This is not a fully grown bush. Remove perennial weeds and fork in organic manure. Work soil to a fine tilth. Soak roots prior to planting. Plant to the depth of the pot. Water during dry periods and fertilise with Growmore (2oz per square yard). Mulch with compost or rotted farmyard manure. Spray as necessary to control mildew, grey mould and greenfly. We measure our plants from the bottom of the pot to the top of the plant. The plant you will receive will be very similar to the one in the photo.